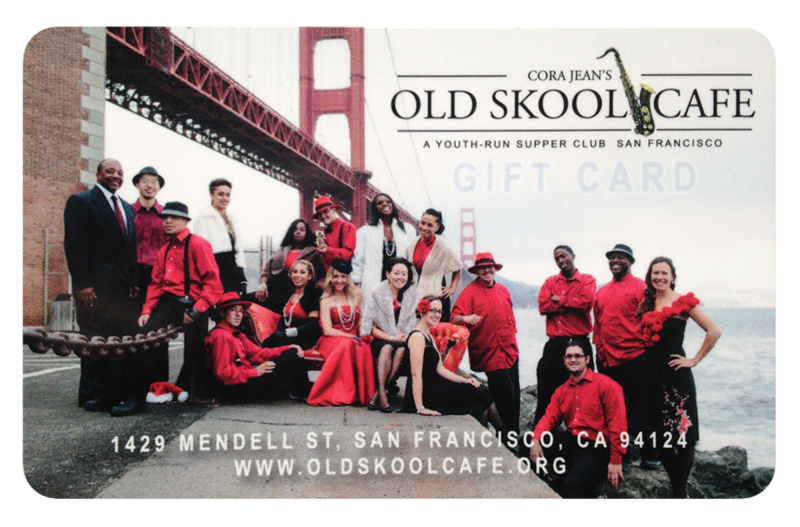 Joshua, a regular youth entertainment at Old Skool Cafe, has been honored as a National YouthArts Finalist and participated in Grammy Camp: Jazz Session 2015. He is planning to release his debut EP in September. Want to see Joshua perform live at Old Skool Cafe? Check out Old Skool Cafe Entertainment calendar for his upcoming performances in August. A free summer circus at Bayview's Heron’s Head Park. Come by Old Skool Cafe booth and grab a bite to eat before the circus show at 2pm. 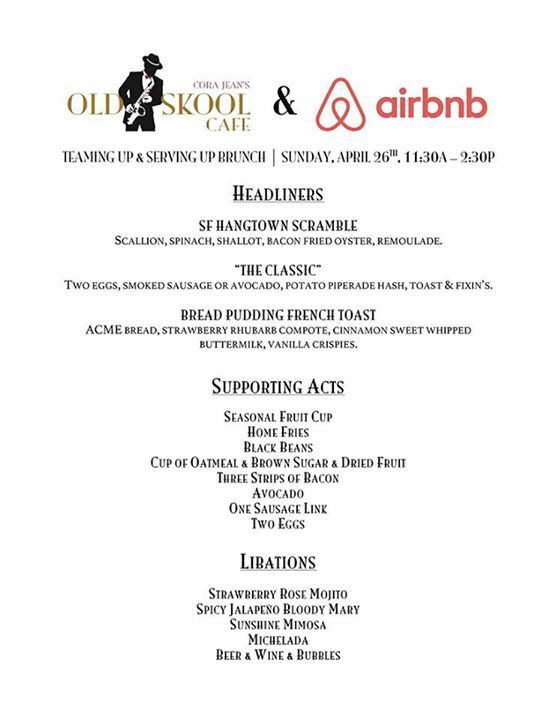 Check out the menu for this week’s Sunday Brunch w/ Airbnb Culinary Ambassador, Chef Luis and our very own Old Skool youth! RESERVE your table now. Final leg of our campaign fulfillment. Spring greetings to everyone! Just a quick update to let you know we are on the final leg of our campaign fulfillment tasks. For those of you who contributed at the $1000 - "You'll Always Have a Seat" level, your nameplates are in process. We appreciate your patience. For ALL other contributors, your campaign perks should have already arrived. We hope you are enjoying them. If for some reason you have not yet received your campaign perk, please let us know by sending an email to info@oldskoolcafe.org and we will get your perk to you ASAP. Wishing you all a wonderful spring season. Heartfelt thanks to ALL of you for supporting Old Skool Cafe. Working to fulfill all the campaign perks this month. We have been working to fulfill all the campaign perks this month. All of the Mortar Level-Coffee Mugs, WOWZA-BowTies, and Dinner Special Gift Cards have been mailed out. If you are expecting one of those perks and have not received it, please contact us via this campaign, or send a note to: info@oldskoolcafe.org. Our apologies to the folks who's perks include the limited edition Tshirt. (Including the Gift Pack Perks.) We have not forgotten you. We expect to be shipping those out by the end of the March. Your patience is greatly appreciated, we are very grateful to all for your participation in our campaign. It's the final day, just hours left for our campaign! We are so grateful for all your SHARING and SUPPORT! PLEASE continue to SHARE the Old Skool Ceviche recipe we have posted on our Facebook and Twitter pages. It's really working! Your sharing has really helped our fund grow these last few days. THANK YOU! Here is a sneak peek at the "special edition" Old Skool Cafe T-shirt. This new T-shirt design comes with the $50 perk and the Gift Pack perks. It's not too late! Please follow the links below to Old Skool's Facebook and/or Twitter pages to SHARE and RETWEET the $5 promo images posted there. No contribution is too small, and each will be matched up to $5000. We really appreciate your help getting the word out.